Ms Ali has recently raised the matter to Brandon Lewis MP, Minister of State for Housing and Planning, calling on him to investigate rogue RSL EastEnd Homes’ failure to refurbish the estate despite millions of pounds in local and national government grants they received for this, and contracts that they signed with the council promising the refurbishment. The meeting, to be held at 5:30pm in the BBC Community centre on the Holland Estate, E1 7NR, will be a forum for residents to discuss their concerns in public and to be updated on the progress of the campaign to save our homes. EastEnd Homes propose to demolish the homes of 600 residents of the Holland Estate in London’s Spitalfields rather than honouring commitments made to refurbish the estate when they were given the housing stock by Tower Hamlets Council in 2006. A residents’ petition recently recorded 73% of households demanding that their estate be refurbished rather than demolished. The petition was presented at an EastEnd Homes Board meeting on Monday 15th June, at which the board discussed the registered charity’s failed attempts at resident consultation on the proposals. Residents were angry that it was left to them to carry out the petition in the absence of any meaningful consultation by EastEnd Homes themselves, well over a year into their redevelopment planning. The estate was given to EastEnd Homes by Tower Hamlets Council in 2006, on the condition that the housing stock be refurbished. But to date, EastEnd Homes have ignored residents’ calls for this promise to be honoured and instead ploughed on with their demolition and redevelopment feasibility study. On Thursday 11th of June the Estate Management Board – a body of residents elected to represent the views of residents to EastEnd Homes – voted unanimously on a motion for EastEnd Homes to abandon the demolition plans and instead to make good on its promises of refurbishment. Residents have said that the charity’s proposed scheme amounts to indefensible overdevelopment, purely driven by the desire for profit from the luxury apartments with which they propose to replace the estate. They argue that the charity is sacrificing the welfare of the current residents that they are supposed to be helping. The estate is located a stone’s throw from Liverpool Street on prime development land at the border of the City of London and the rapidly gentrifying area of Brick Lane. The mid-century L.C.C London stock brick blocks border several local conservation areas and nestle among the many listed buildings that comprise the architectural heritage of Spitalfields. 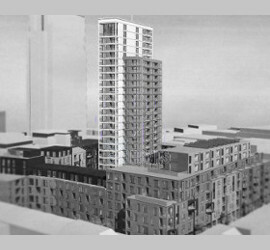 EastEnd Homes’ redevelopment plans are to replace the existing mix of 192 tenanted and leasehold low cost and social rent homes with a 25 storey tower block containing 263 luxury flats for sale on the private market and only 165 “affordable” homes. With the government’s current model of affordable rent allowing social landlords to charge up to 80% market rate this would place the new homes well beyond the reach of current residents. Residents previously gained cross party support when they took their case to Tower Hamlets Full Council in April. Councillors voted unanimously on an emergency motion in support of residents’ demands for the promised refurbishment of the housing stock. Now that the strength of residents opinion of demolition is clear, with remarkable cross-party political support from all sides of Tower Hamlets Council, and with both the Mayor and the local MP backing their campaign, the residents of Barnett, Brune, Bernard, Carter and Wheler Houses wait eagerly to hear if the demolition plans will finally be dropped, as requested. Will EastEnd Homes, a charity and registered social landlord, continue with their unpopular plans to break up a community and over-shadow a conservation area with towering luxury investment opportunities for transnational capital?